Ask anyone who knows London what they understand by the term Whitehall and, more likely than not, they’ll tell you it’s the seat of the British government. And they wouldn’t be wrong – through just a short walk you can take in Downing Street, the Ministry of Defence, Foreign Office and other important ministries. But while all this is correct, it is a narrow view of Whitehall which only takes into account the district’s history over the last few centuries. Quite simply, there is so much more to discover about this fascinating area. Whitehall was the site of a grand palace which was in Royal hands from Tudor times. Henry VIII seized what was York Place from Cardinal Wolsey in 1530 when he fell out of favour with the king and embarked on an enormous building project, transforming it to the most magnificent palace in Britain. In addition to sumptuous private rooms and public areas (an inventory taken at Henry VIII’s death in 1547 records diamonds, jasper, enamel, every-kind of textile colour imaginable and many other treasures), it included ornamental gardens, plus a recreation centre with tennis courts, a bowling alley and a cockpit. At its peak in the late 1600s Whitehall Palace was the largest in Europe, with some 2,000 rooms and stretching all the way from what is now Trafalgar Square to Westminster. Today all that remains of Whitehall Palace is the Banqueting House which was commissioned by James I in 1619. Bar a few surviving fragments elsewhere from the former complex the rest was destroyed in a devastating fire in 1698 and was never re-built. The Court moved to St James Palace – still the official residence of the Queen. Historic Royal Palaces, the charity which manages what remains of Whitehall Palace, doesn’t really do justice in bringing its 500 years of fascinating history to life. Merely calling the site Banqueting House in promotional material ignores the fact that pre 1698 it was part of a much larger complex. What is needed is a comprehensive museum exhibition charting ALL of Whitehall Palace’s history, right from the time of Henry VIII (and indeed before when, as York Place, it was home to the archbishops of York). This could perhaps be developed in the vaulted undercroft (created as a drinking den for James I and his friends) of the surviving building, where visitors can currently see an introductory film. Despite its shortcomings in historical context, Banqueting House is an amazing, well-preserved masterpiece (for which the team at Historic Royal Palaces deserve full credit). At a time when surrounding buildings were still largely constructed of timber (a hangover from the Tudor), when it opened in 1621 this stone venue would have stood out as a true jewel. It was designed by Ingio Jones, the king’s surveyor and was the third such banqueting house to stand at Whitehall (the first was a wooden construction commissioned by Elizabeth I and the second being a stone structure built on the orders of James I, but only standing for 10 years before it burned down). Rather than, as its name suggests, being a venue for feasts, Banqueting House was where masques were held. These were theatrical events, with music, dancing, spectacular lighting and other special effects. The Masques of Queens, for example, opened with a scene from Hell, complete with fire and smoke, before a “glorious and magnificent building figuring the House of Fame…. filled with several-coloured lights with emeralds, rubies, sapphires, carbuncles etc” was revealed. But following the installation in 1636 of stunning ceiling paintings by Peter Paul Reubens (which are perfectly preserved for visitors to see today) the masques needed to be moved elsewhere so the smoke did not damage the paintwork. 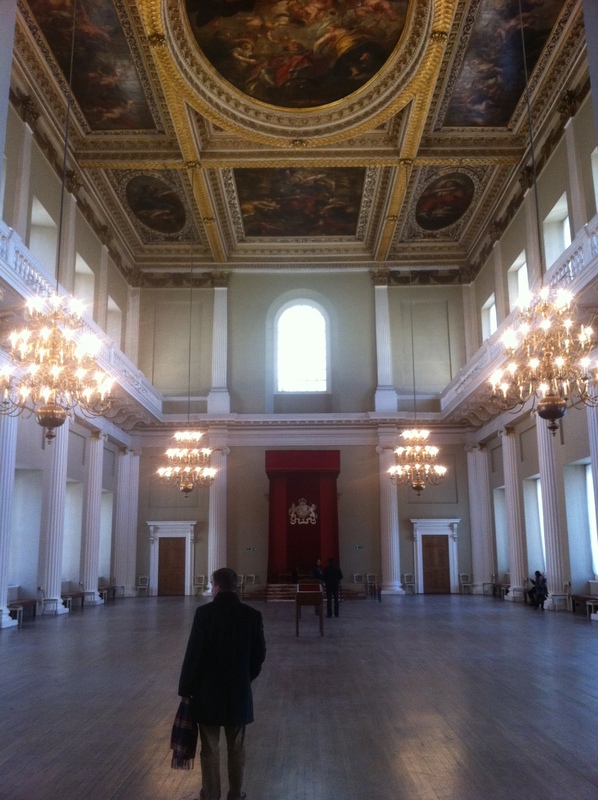 Banqueting House was still however used to receive ambassadors and other dignitaries. Ingio Jones’ Banqueting House has, over the years, been the site for a number of key events in British history. It was the last interior that Charles I would have seen before he was executed on a temporary scaffold outside. He would have stepped out of a window, near the spot where visitors enter the main hall today, on a chilly January day in 1649. And after James II fled from Whitehall Palace in a secretive operation in 1688, two months later William and Mary were formally offered the crown in the Banqueting House in the so-called Glorious Revolution. Some 400 years on from its construction, the Banqueting House is still used through the year for a packed programme of royal and society occasions. When the last visitors leave for the day a team busily lays out tables and decorations for evening receptions. But while the Banqueting House is a fitting reminder of Whitehall Palace’s fascinating past, the life and times of the rest of the complex deserve to be properly remembered. 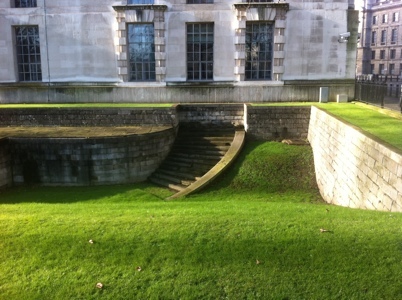 Alongside the Thames you can, for example, see steps built for Queen Mary, leading down from a terrace in front of her new apartments to the river’s edge. Yet the signage marking this historic feature has seen better days. It’s time that ALL of Whitehall Palace’s history is properly charted.